The speed of business has increased, and the direction exhibitors are forced to go has only become more harried since our landmark 2008 study The Invisible Exhibitor. The latest research by industry journalist Michael Hart and our VP, Communications & Public Relations Dana Freker Doody will be presented in a 45-minute participatory webinar at 11am Eastern Time/ 10 am Central Time on Wednesday, January 30. 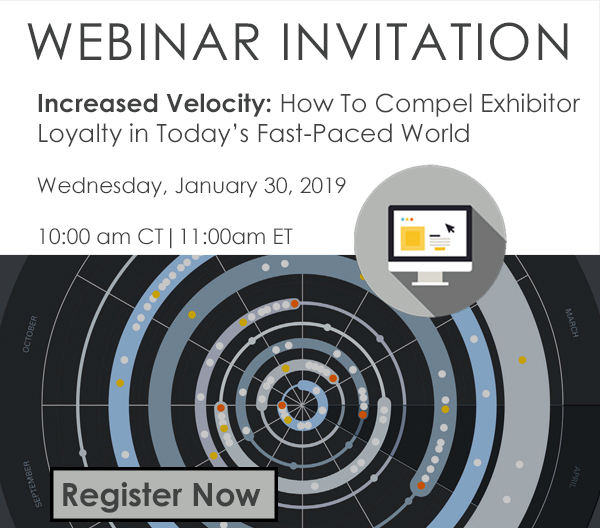 Learn how trade show organizers can take proactive measures to improve processes and create conveniences that compel exhibitor loyalty amid the Increased Velocity.